The largest accropode ever to have been produced by automated factory process has been successfully completed in Aberdeen. The temporary building, which is 15 metres high and 120 metres long, has been specially constructed to support the £350 million Aberdeen Harbour Expansion Project, which is due for completion in 2020. 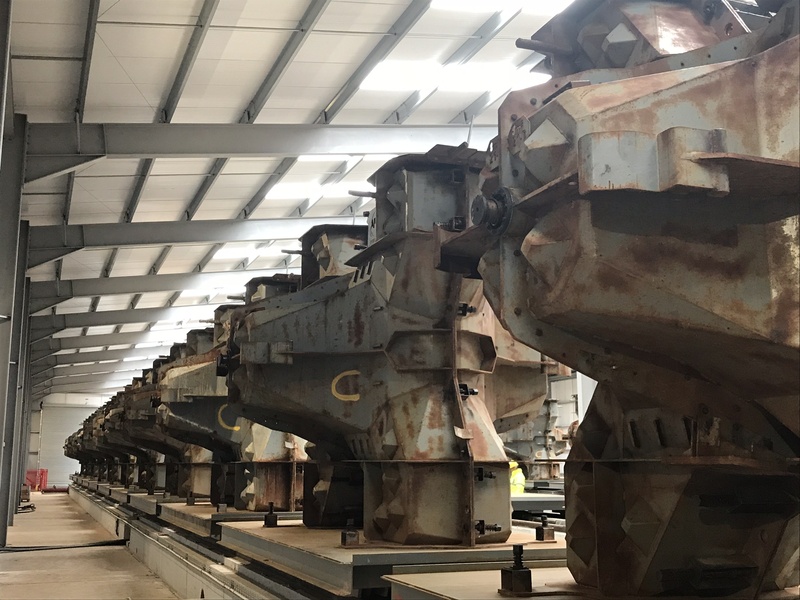 The facility is home to a carousel production system, which will be used to manufacture around 9,000 accropodes, that will be used as the outer armour for the north and south breakwaters. The first 16m3 accropode (pictured) – which was completed this week – is the largest to have been produced by an automated factory process. Keith Young, Engineering Director, Aberdeen Harbour Board, said: “The new temporary facility uses the latest automated technology to ensure a high quality of construction is maintained through each accropode and that they are produced as efficiently as possible. “We have taken care to engineer the new South Harbour to the highest standard, designing it to be protected from a 1-in-200-year storm. The accropode production follows other significant steps forward at the South Harbour expansion, with dredging activities having resumed with the arrival of the hydraulic backhoe dredger ‘Goliath’ (pictured) – one of the largest backhoe dredgers in the world. The dredging operation will remove 2.2 million cubic metres of sediment to increase the water depth within the bay ahead of the construction of the quays over the next two years, and the subsequent development of world-class deep-water berthage. In addition, the first caisson (pictured) – one of the concrete ‘building blocks’ that will be used to start the closed-quay sections of the facility – has been constructed. The caisson, which is 50 metres long, 17 metres wide and 16 metres high, will be floated into position this summer after being transported to Aberdeen from the north of Spain.